Pancha-Pakshi Shastra is based on ancient literature in Tamil language. Pancha means five and Pakshi means Bird. The Pancha-Pakshi system has some resemblance to the Pancha-Bhuta (Five elements) system of Vedic Astrology. It is believed that the Five Elements represented by five birds, influence and control all the actions of human beings. The power that takes effect first on a day or night and the sequence that follows depends on the day of the week and the Paksha (waxing half or waning half cycles) of the Moon. The activity of this Main Bird at a given point of time and the activity of the Sub-Bird at that time and the relationship between them indicates whether the time will be beneficial and lucky for the person or not. Pacha-Pakshi Shasta is very popular in south India especially Tamil Nadu. 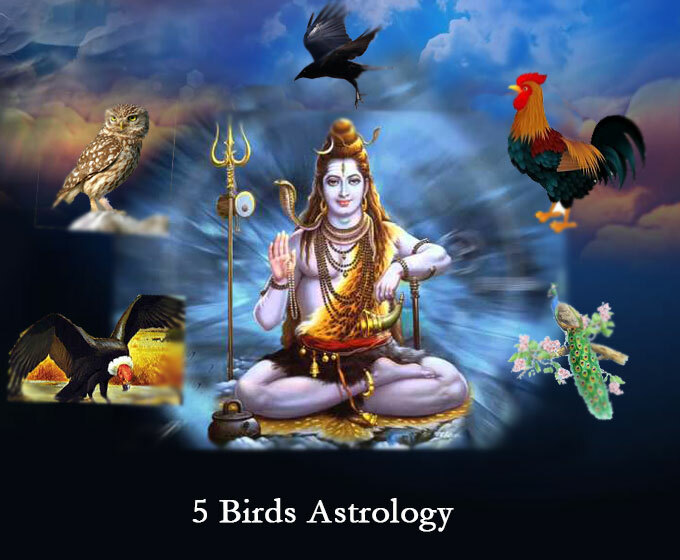 The birds are considered most powerful when they rule and least powerful when they die.To find out your Birth Pakshi (Nakshatra Pakshi) you have to know your birth star according to Vedic Astrology and the Paksha of the Moon at the time of your birth. The half of the Lunar Cycle when the Moon increases in size and reaches the Full Moon (Pournami) is called Sukla-Paksha and the other half of the cycle when the size decreases until the New Moon is called the Krishna-Paksha. Birth Stars are based on the longitude of Moon and are 27 in number from Aswini to Revati. Once you know the Birth Star (Nakshatra) and the Paksha you can find your Nakshatra Pakshi (Bird) from the following chart. The five birds rule certain days of the week and the days when your bird rules are considered good for you. Also, the days on which your bird is least powerful (death days) will be least useful for you. It is best not to undertake important tasks or take decisions on such days. The ruling days and death days also depend on the Paksha of the day you are considering for an activity. While death days of a bird are same for day as well as night, the ruling days are different for day and night. Each day of 12 hours is divided into five equal portions and given to different activities of the birds. Within each portion, the time is further allocated to other birds called apahara birds and their activities.